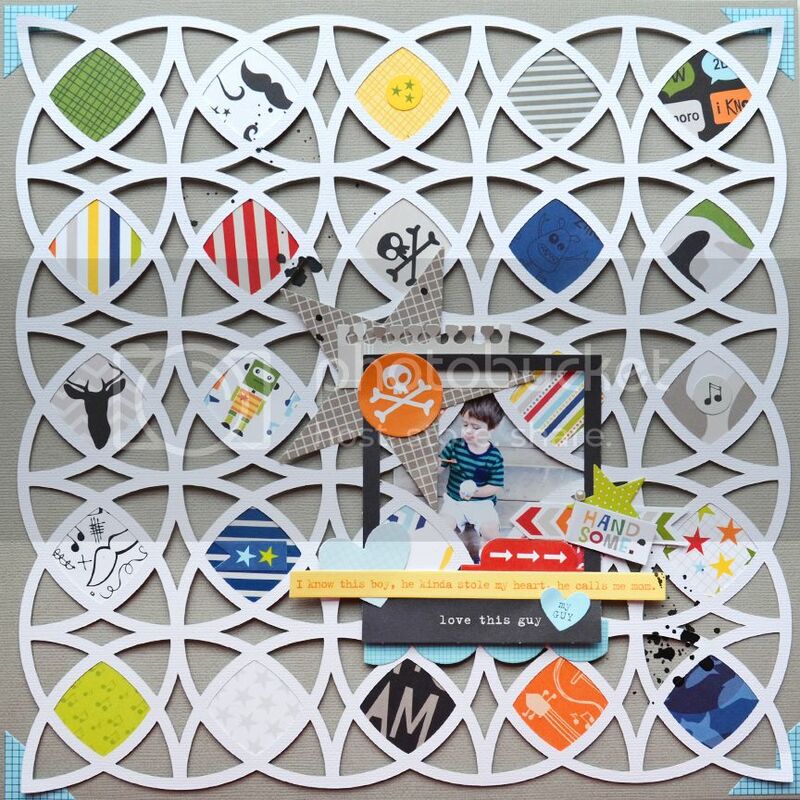 Description: For this layout I used the Max collection - it has foxes in it! Perfect for a layout about Fox :) I loved this geometric cut file and backed it with the Max patterned papers for a pop of color. Journaling says: Handsome. I know this boy, he kinda stole my heart, he calls me mom. Love this guy. My guy. 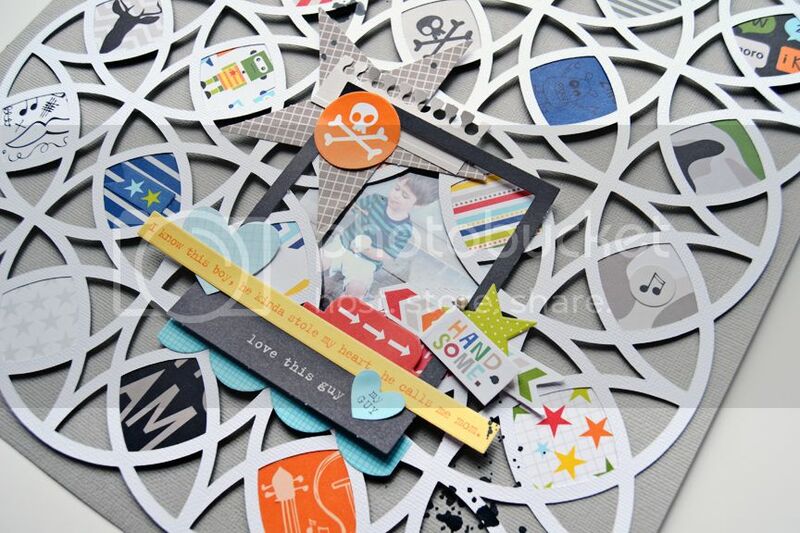 How to: Die cut a geometric background from white cardstock. Back some of the spaces with patterned papers then adhere it onto a gray cardstock background. Place a photo corner sticker on each corner. Trim away a section of the cut, tuck a photo underneath, then go to town layering on the stickers and die cuts and a flag stickpin. Drop India ink around the layout. Description: I used the Lucky Starz collection on this layout - fitting for this "true love"-themed layout because I thank my lucky stars for Chris every day! Journaling says: Dear Christopher - how do I even begin to tell you how much I love you? You are the best husband and father and every day I thank my lucky stars to have you in my life forever and always. I love you so much, I hope you know! 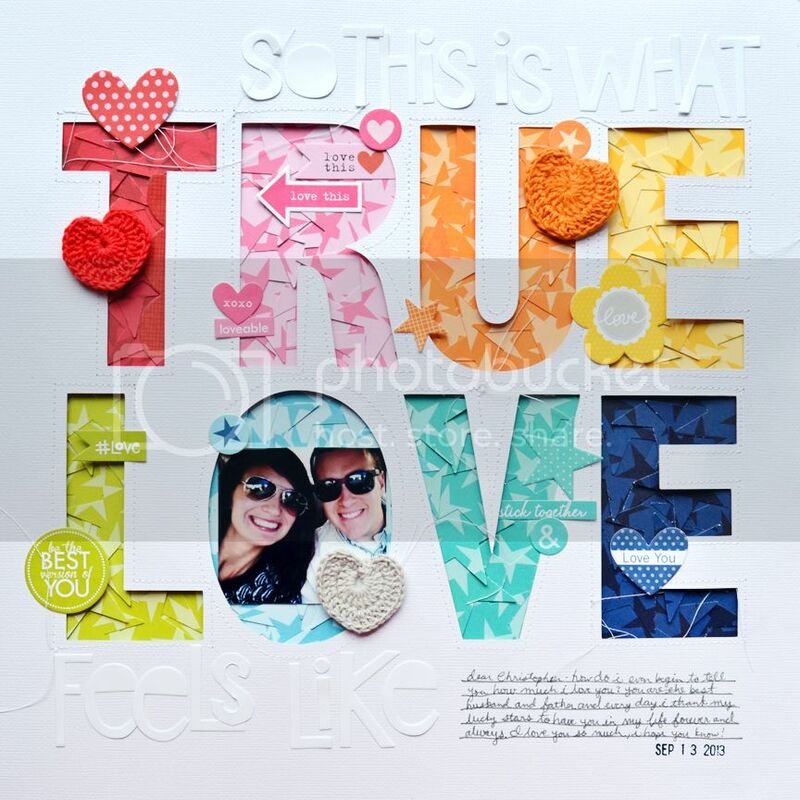 How to: Design a "TRUE LOVE" file in Silhouette Studio then cut it from white cardstock. Stitch around the open letters. Punch a bunch of stars from the rainbow of star patterned papers then use the stars to cover the die cut letters. 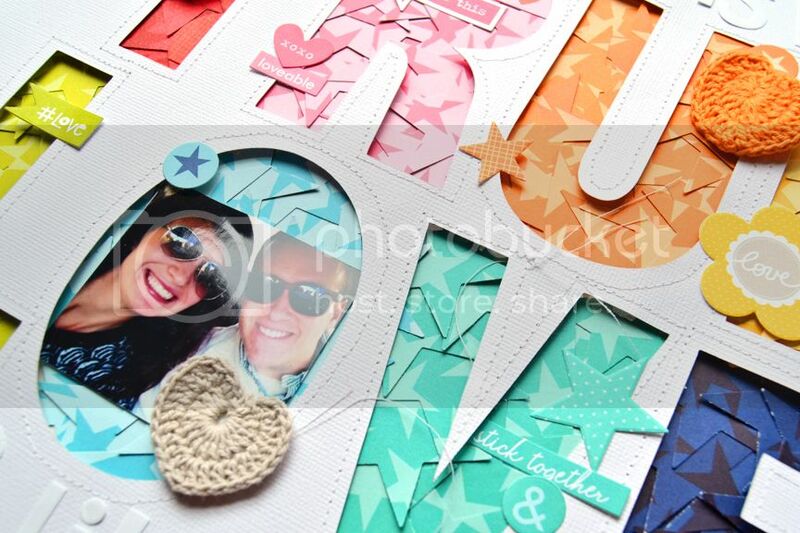 Use the covered letters to back the open holes of the die cut cardstock. 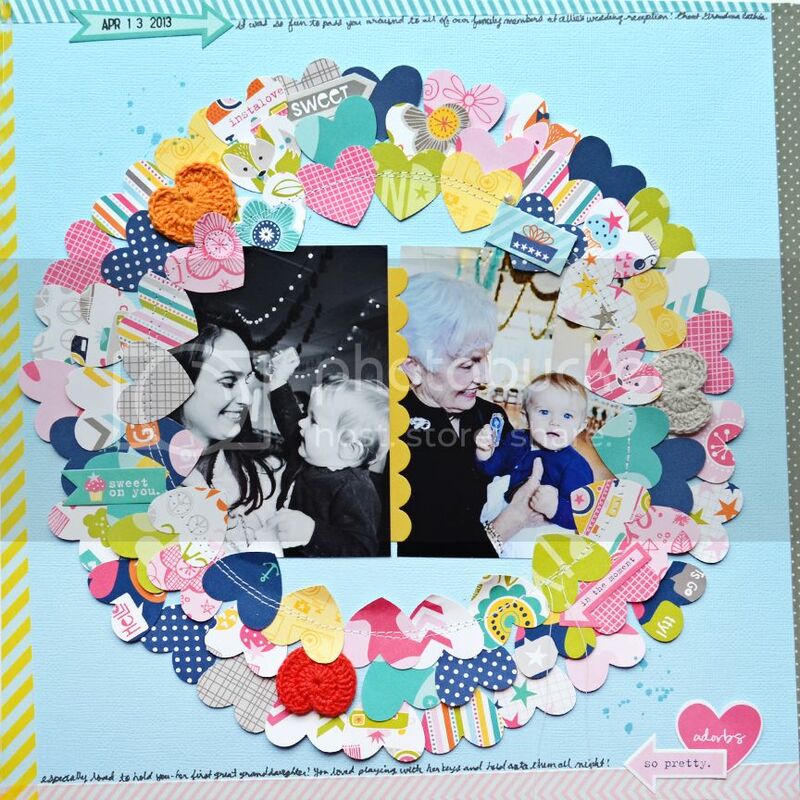 Embellish with matching colored stickers across the page and tuck a small photo into the "O" space. Place white letter stickers across the top and bottom to complete the title then journal on the bottom right corner. Stamp the date below the journaling. Description: The Molly collection was so lovely paired with these photos of me and Jane and Jane with her Great Grandma Cathie at my sister's wedding reception last year. So bright and fun and colorful with a touch of girly! Journaling says: It was so fun to pass you around to all of your family members at Allie's wedding reception! Great Grandma Cathie especially loved to hold you - her first great granddaughter! You loved playing with her keys and held onto them all night! 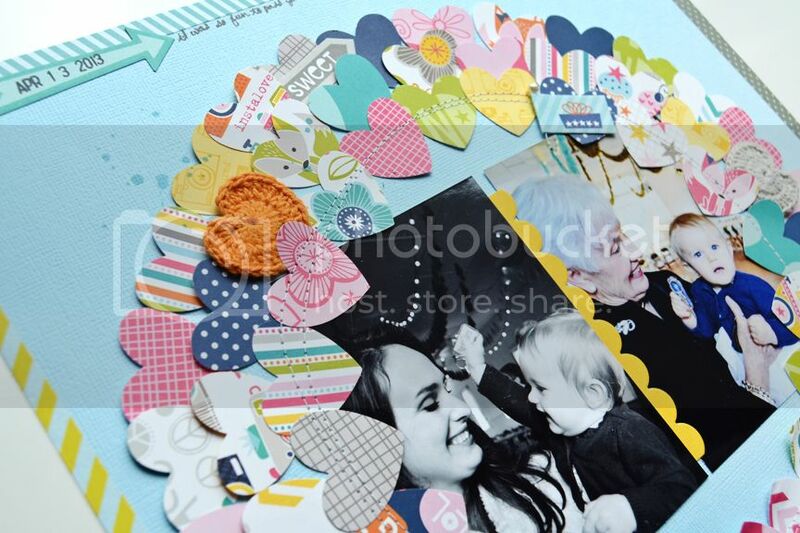 How to: Punch hearts from the Molly papers then place them in three rings around two photos adhered on a blue cardstock layout base. Sew around the first ring of hearts. Embellish with stickers and a flag stickpin. Place washi tape on the edges then journal along the top and bottom. Stamp the date on the top left side. Drop blue spray mist around the layout. LOOOOOOOVED guest designing for Bella Blvd! LOVE the true love layout! Beautiful! A.MAZ.ING!!! I was excited to see these! Great work! Wow! These are so artistic, creative, and beautiful! Congrats on your guest spot, Paige! These are all amazing! Your designs always blow me away!! HUGE CONGRATS on the GDT!! You are amazing!! These are gorgeous!!! !